The avian influenza virus forced food and beverage manufacturers to find egg alternatives due to egg shortages and price spikes. As concerns subdue, egg substitution lives on to meet emerging trends and growing demands. 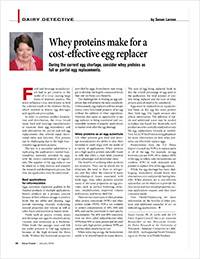 Susan Larson explains how U.S. whey proteins are a nutritional, cost effective and sustainable egg replacer.